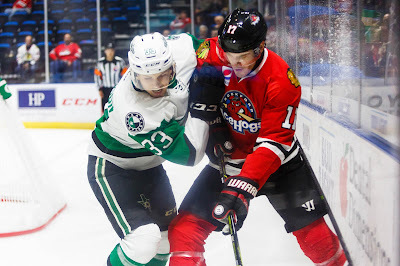 Texas went down 2-0 and could not recover this evening as they fell to Rockford IceHogs in Illinois tonight by a 2-1 final. Greg Rallo had the game's only goal for Texas. The Illinois native has four points in his last seven games as he's been getting more consistent ice time after the Mark McNeill trade. The IceHogs opened the scoring on the power play in the first period as Cody Franson beat Mike McKenna. Early in the second, Luc Snuggerud pushed the lead to 2-0 with his fourth of the year. Both tallies were assisted by new addition to the Rockford roster Chris DiDomenico. The Blackhawks acquired DiDomenico from Ottawa in exchange for Ville Pokka two weeks ago. Texas would get one back but could not come up with the tying tally late in the third. Rookie Collin Delia stopped 38 of 39 Texas shots in the contest to earn the win. Mike McKenna suffered the loss with 27 saves to his name. The Stars return home to play Chicago on Saturday night. Following yesterday's shootout loss, Texas rolls into Rockford this evening for only their second game of the season against the Hogs. 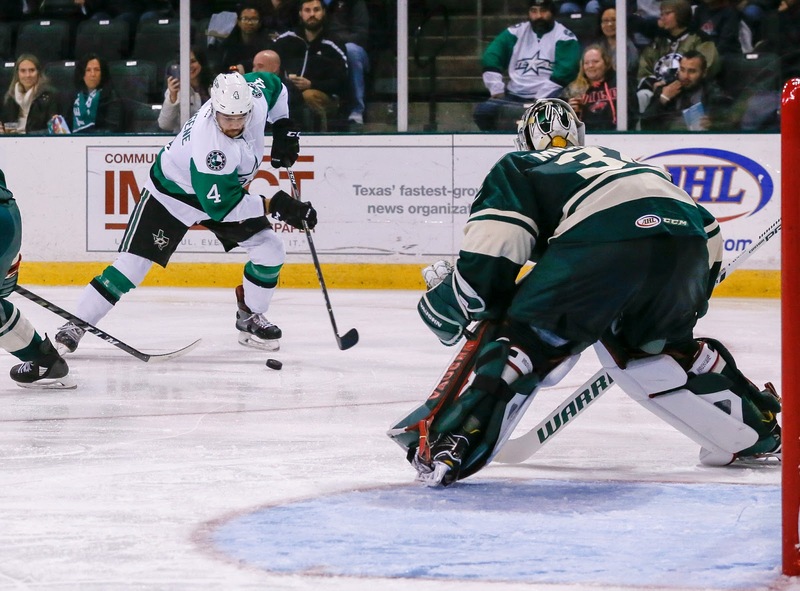 The Stars will host Rockford in the last week of the season for a back-to-back set. Their previous matchup was a 6-2 loss for Texas that was an aberration, as it was surrounded by five wins coming in and three wins thereafter. The Stars will have to continue getting things done without Jason Dickinson, as it looks like the forward has cemented himself in the NHL for the rest of the season. He is still AHL playoff eligible, as is Remi Elie, but no one else is from Dallas at this moment. That includes Julius Honka. The Hogs just took a little Eastern Conference swing, which is rare for Central Division teams and unheard of for the Pacific. They did a Pennsylvania two-step, losing in Wilkes-Barre 6-3 but defeating the ailing Bears 4-3 in overtime. Prior to that win, they had just one victory in their past six games, sliding them to fifth in the Central and out of the playoff picture. Rookie Collin Delia has been working the crease more frequently recently for the Hogs with a 9-6-2 record and .887 SV%. Jeff Glass is their other netminder, and he sports only slightly better stats. For the Hogs, many of their top players from the season as a whole are unavailable. Matthew Highmore, Tomas Jurco, Carl Dahlstrom and Vinnie Hinostroza are all in Chicago and rank in the top six of scoring for Rockford. Remaining top scorers include plenty of rookies, including Anthony Louis (10-22=32) and Tyler Sikura (16-7=23). 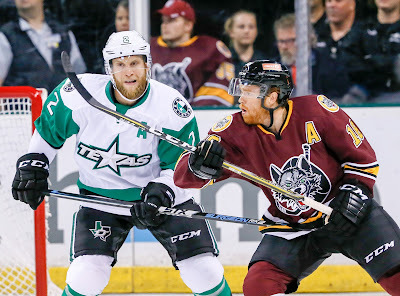 The Chicago Wolves picked up their first win over the Texas Stars this season with a 4-3 shootout victory in Rosemont, Illinois this afternoon. Each game this season between these two teams has been decided by a single goal and three of them now in overtime. Denis Gurianov and Roope Hintz each had a goal and assisted on the other's tally in the game. Hintz returned from injury with a strong effort. The Wolves got on the board first and quite early. Bryce Gervais scored just 24 seconds into the game to take the 1-0 lead. Things got no easier for Texas in the period as Austin Fyten took a five minute major and game misconduct for boarding. Texas killed the major power play and another minor in the period. At the end of twenty though, Texas was outshot 21-6. At one point during the frame, they trailed 18-1 on shots. The Stars answered back in the second period on consecutive shifts. Roope Hintz put a rebound through the legs of a Wolves defender for the tie at 4:16 and Brent Regner blasted one from the top of the right wing circle for the 2-1 lead just 13 seconds later. Brandon Pirri would score to tie things back up, however, before the end of the frame. The teams traded goals in the third period with Chicago reclaiming their lead early on. Keegan Kolesar collected a homerun pass from Pirri and beat Bow for the 3-2 lead. Denis Gurianov continued his strong play with a goal off the pass from Andrew Bodnarchuk. It was Gurianov's 12th point in the last 11 games. Both teams looked to break through in the third period late, but overtime was unavoidable. With no score in the extra period, a shootout ensued. Tyler Kelleher was the lone goal scorer for Texas as Brandon Pirri and TJ Tynan both netted goals for Chicago to win 2-1 in the shootout. Landon Bow had a busy day, stopping 41 of 44 shots. Oscar Dansk only saw 23 shots by comparison. Texas now heads to Rockford for a game there tomorrow night. The spaced out schedule against the Chicago Wolves concludes today with a day game in Rosemont. After taking two games against the Wolves to open the season in Cedar Park, Texas also claimed a mid-November OT game in Chicago. Texas has three more games against the Wolves including today's. The last time these two teams played, however, Chicago was in a very different place. The Wolves were five games below .500 and in last place in the division. Since losing to Texas, they've rebounded with a 24-9-5-1 record. It's good enough for 3rd place in the division. The past weekend they traded wins with division-leading Manitoba. Texas has been the winner in four of its last five. Speaking of trades, the Wolves fanbase is breathing a sigh of relief that parent club Vegas didn't get anything done for Erik Karlsson yesterday. Surely that trade would have come by way of prospects in the AHL among many other assets. Mike McKenna has started five of the last six. Will Laxdal ride the hot hand or mix in Landon Bow? Roope Hintz oculd return to the lineup today. He was 50/50 on Saturday and didn't go. Steve McParland was added to the Stars' roster last night after Texas lost Jason Dickinson to NHL call up. Max French was also recalled. The Dallas Stars have recalled Jason Dickinson from the AHL. With Remi Elie, Dallas has now used two of its allowance of four post-deadline callups. The Texas Stars have also recalled Max French from Idaho in a transaction they posted on Twitter. Dickinson, 22, has appeared in 13 games with Dallas this season registering 12 shots and ten penalty minutes. In 36 games played with Texas this season, he has produced 24 points (16-8=24) and his 16 goals are tied for second on the team. Dallas Stars GM Jim Nill stood pat on Trade Deadline day. 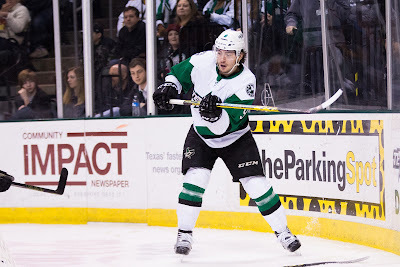 The only transaction at all for the Stars today was a paper transaction to put Remi Elie on the Texas Stars roster at 3 PM Eastern, making him eligible for the rest of the AHL season and the playoffs. Notably, this means Julius Honka cannot play in the AHL the rest of the season. It was tight playoff hockey against Milwaukee for a third game in a row. That is, until it wasn't. 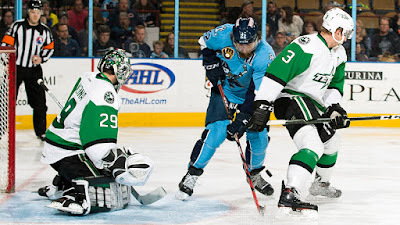 In just 56 seconds in the second period, the Admirals saw their 1-0 lead evaporate into a 3-1 deficit as Texas roared to life offensively against usually stingy Anders Lindback. "Huge weekend for us," said defenseman Andrew O'Brien, who scored the game winner and added an assist. "And it's nice to get two wins against a team that traded you away." Milwaukee scored first, but the Stars had tons of chances in the period. "Lindback did a great job keeping the score 0-0," said Texas coach Derek Laxdal. "We had four grade A scoring chances we should have buried on him. He did what he had to do." However, Texas got even quickly and without mercy in the second period. Petter Granberg kneed one of the Stars, and Brian Flynn stepped up and took exception. It wasn't a full-on fight, but the pair got two each for roughing, setting the stage for 4-on-4. "Give Brian Flynn a lot of credit because he sparked our team, He stood up for his team and that gave us a bit of a spark in the 4-on-4. It was a huge turning point in the game." Brent Regner went first with a good keep on the left point, a walk of the blue line and a floating slapper to beat Lindback and tie things at one. With the goal not yet announced in the building, the Stars went again, just 14 seconds later. Sheldon Dries got the rebound on a Tommy Thompson shot for the 2-1 lead. Milwaukee took their timeout, but it didn't stop the bleeding. Andrew O'Brien scored his aforementioned game-winner on another rebound, his first of the year, just 42 seconds later. In all, Milwaukee saw their lead turn around in less than a minute. Three minutes later, Travis Morin scored from a sharp angle off the right wing side, and it was pretty clear the game was over. Texas and Milwaukee traded goals in the final frame, but those few minutes in the second put the Ads in too much of a hole to recover. "[Lindback's] a great goalie," noted O'Brien. "He doesn't let many in like that, so I'm a little bit surprised." Texas didn't need the goaltending as much tonight, but they got it anyways. Mike McKenna took sole possession of the 10th spot in all-time AHL wins with 35 stops of 37 shots. "He's in a really good groove right now. He's know what that second half is all about. We've been relying on him a bit and he's been giving us great performance." Texas could have easily won the game by an even wider margin as the offense was clicking all over the ice. Colin Markison had at least three solid chances at a goal, including a scintillating shorthanded opportunity he just missed on. "He's got great speed," said Laxdal. "Probably one of the fastest guys in the league. The feedback on Markison is that you'll get 9 or 10 breakaways a game, and he'll probably score on one. He's creating with his speed and pushing defense back. He's been a great find. He's been the unsung hero for our team this year." Dillon Heatherington, who later got an assist on Dowling's third period goal, missed a tough backdoor play by just a few inches in the early third. Every line had chances. "I'm happy with how the team is responding. It's just simple plays. When we try and get cute, we don't get the chances. The group we have now has done a good job of playing simple hockey, checking well and staying above the puck. When we get [Hintz and McKenzie] back, it will be like getting a player at the trade deadline." The NHL trade deadline, by the way, is Monday. Texas plays in Chicago on Tuesday for a rare day game. Roope Hintz is day-to-day. The Stars tried to get him in today, but he wasn't ready this morning. He will try again Tuesday in Chicago. The Stars have had Milwaukee's number this year, but that doesn't mean past results guarantee future success. The Ads had a bucket load of shots last night, 36 in total, but it was Mike McKenna who got Texas the W. Really, both goaltender played very well. It could have easily been a 6-5 final either way. Coach Laxdal mentioned last night that he didn't want to concentrate too much on mentioning slow starts as it might become something of a self-fulfilling prophecy. Coming out of the first scoreless, as Texas did last night, would be a great outcome if for no other reason than the club isn't behind to get started. 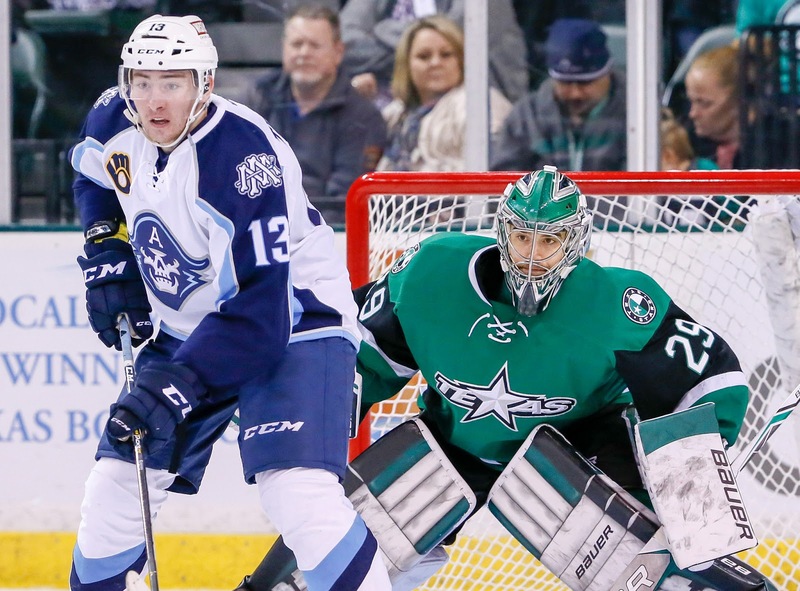 The Admirals haven't had a chance to flex their top ten power play against the Stars. In two games the Ads have scored just once, last night on a weird 5-on-5 play that was technically shorthanded with Anders Lindback on the bench late. If Texas can continue not giving up opporutnities to play 5-on-4, as they did last night with just two penalties, the point will be moot. 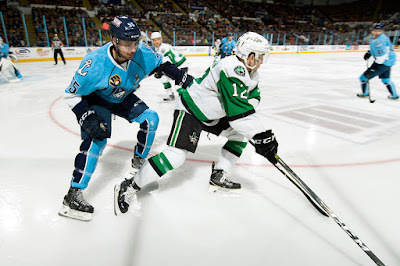 Coming off a pretty successful three game road trip in which they collected four points, the Texas Stars continued trending in the right direction with a 3-1 hard-earned win over the Milwaukee Admirals. Mike McKenna put together another excellent performance between the pipes, stopping 35 of 36 shots and moving into the top 10 of career wins for AHL goaltenders with 218. The Stars were the beneficiaries of two power plays within the first 10 minutes and generated plenty of decent looks. They were getting pucks to the net through traffic but couldn't quite get one past former Star Anders Lindback. The Stars finished the game 1-for-5 on the power play. The first period was scoreless, but the Stars had a couple of nice looking odd-man rushes in the frame that just missed including one from Gurianov setting up Matt Mangene across the crease. That play was a foreshadowing of things to come in the third period when Mangene would return the favor on the power play, setting up Gurianov for a goal. A little over five minutes into the second period, rookie defenseman Gavin Bayreuther broke open the scoring with a slapshot from the point. Dowling made a clever play along the boards, protecting then dropping the puck back to Bayreuther on the right side where he was able to play the puck with his forehand. Flynn had the secondary assist on the goal and initiated the play with deft puck protection. It was a common theme for Flynn in the game as the winger was quietly making the right play on every shift, especially on the power play. He and Dowling both had two points a piece in the game. Other than the Bayreuther goal, Lindback was strong in the second period, especially when he had to break up a couple more rushes. “Lindback was outstanding and kept them in the game,” said Laxdal. “It could have been 2-0 or 3-0.” In the opposite net, McKenna stayed perfect through two periods while the Admirals fired 21 shots on net. As well as Lindback had played up to that point, he committed a serious blunder a few shifts later. Staring down an incoming forechecker, he hastily played the puck up over the glass for a delay of game penalty. The Stars finally cashed in on the fourth chance of the game with the Mangene to Gurianov connection that almost worked in the first period. With 2:26 remaining in the game, the Stars went on another power play, and the Admirals emptied their net when they got possession. It paid off momentarily when defenseman Trevor Murphy scored on the rush, ending McKenna’s shutout bid. Though he didn’t get the goose egg he wanted, it was still a special night for him. 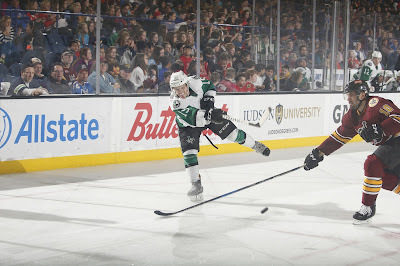 The Stars wrap up their back-to-back set against the Milwaukee Admirals on Saturday, February 24th. The puck drops at 7:00 PM CST. 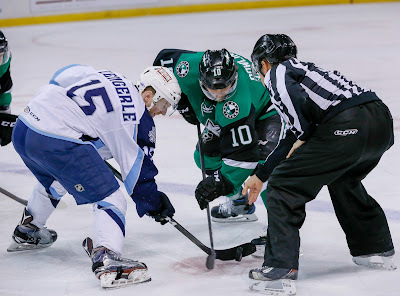 Coming off a successful three-game road trip that netted them four points, the Texas Stars return home to take on the Milwaukee Admirals. The two teams squared off last week in a matinee affair that saw Sheldon Dries score the lone goal and Mike McKenna posting a shutout. The Admirals have had a similar roller coaster arc to their season in a less forgiving division. They are backstopped by former Star Anders Lindback, who is having a solid season. The Olympics are over for their leading scorer, Bobby Butler, but don't expect him to play in this game. In Butler's absence, Emil Pettersson has tied him in points (34) and is carrying the pail offensively. One lingering unknown for the Stars is the availability of Jason Dickinson. He could be called up again to the Dallas Stars at any second given the status of Martin Hanzal, who suffered another injury in Thursday's game against Anaheim. Hanzal has been graded as day-to-day for the rest of the season, so expect Dickinson's status to continue to be tied to Hanzal's health. 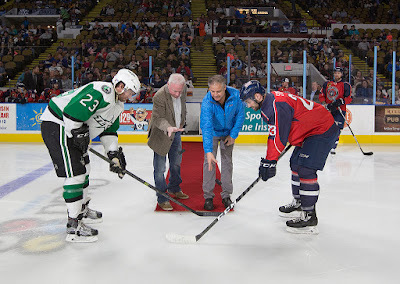 Before last week's game against Milwaukee, we at 100 Degree Hockey had our annual exchange with Daniel Lavender at Admiral's Roundtable. You can go a little more in depth by reading Daniel's takes on the Admirals here. 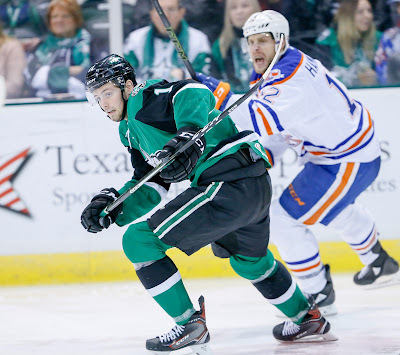 The Texas Stars have assigned defenseman Shane Hanna to the ECHL's Idaho Steelheads. With Texas adding Andrew O'Brien to the lineup, the Stars have been scratching three defensemen in the past three games. Hanna was the odd man out, so he heads to Boise. The Texas Stars, American Hockey League affiliate of the NHL’s Dallas Stars, announced Wednesday that rookie defenseman Shane Hanna has been returned to the ECHL affiliate of the team, the Idaho Steelheads. Hanna, 22, has appeared in 14 games for the Stars and tallied two assists this season. The 5-foot-11, 200-pound defenseman spent the previous four seasons playing at Michigan Tech before beginning his pro career. In 28 games with the Steelheads, the Salmon Arm, British Columbia, native has 15 points (4-11=15). The Texas Stars picked up four of six points on the weekend but couldn't come back in tonight's contest against Iowa to make it a clean weekend sweep. Michael Paliotta opened the scoring with his first as a Star but Iowa tallied a goal in each period thereafter to eke out a 2-1 win in Des Moines. Landon Bow drew in for his first start of the weekend and stopped 25 of 27 shots against him. Overall, shots in the game were spread very evenly across the teams and periods with 27 for both sides and 18 combined shots in each period. Iowa's game winning goal came in the final frame on the power play with Greg Rallo in the box for hooking. Texas could not convert on their pair of opportunities, both coming in the last 10 minutes when they were down by a goal. Viktor Loov picked up a rare penalty in the game as well with an unsportsmanlike call for "disputing decision". That is likely what most unsprostamnlike calls are, but it is rare to see that in the game sheet. The loss dropped Texas to fourth place but only by a thousandth of a point. The Stars return home for a pair against Milwaukee this weekend. A rare Monday game comes into focus tonight as the Stars finish off a 3-in-3 weekend, all on the road, with a chance to sweep the trip and further cement their place in the playoff race. A win keeps them in 3rd, but a loss will drop them to 4th. Yesterday's loss for the Wild dipped them all the way to 4th place in the Central, technically a tie for 3rd with Chicago. However, it's extremely clear that the entire Western Conference is highly competitive this season. Landon Bow has to figure in today as Mike McKenna has started the last two games, both wins. As always, Texas should expect a second night response from the Wild. Iowa has only lost in regulation back-to-back twice this season: to open the year against Milwaukee and two weeks ago in California. This will be the last game of the season in Iowa for Texas, and the season series will complete in two weeks at home on March 7th. 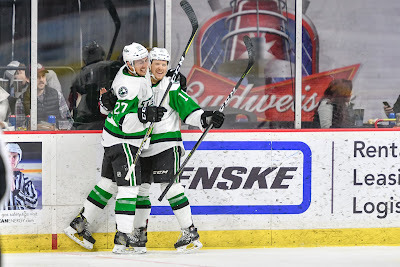 Denis Gurianov talled a goal and two assists while Mike McKenna followed up last night's shutout with another strong performance to cap a 6-3 Texas Stars win. The Stars had goals 4 different ways with a power play marker by Brian Flynn, a shorty from Sheldon Dries, an empty netter from Tommy Thompson and even-strength goals from Greg Rallo, Gavin Bayreuther and Gurianov. The Stars earned the win on the back of a three-goal second period. Coming into the second down 2-1, the Stars emerged up 4-2, getting it started with Flynn scoring on a penalty to Kurtis Gabriel. Texas was perfect on the penalty kill, stopping all six chances by the Wild. That included a 4-minute minor to Austin Fyten for high-sticking in the second and 5-on-3 that lasted 117 seconds. Mike McKenna stopped 22 of 25 shots against to earn his second win of the weekend. The Stars continue their 3-in-3 weekend with a pair of matinee games in Des Moines. The clubs have only battled once so far this season, a 5-4 overtime victory for Texas on December 5th. Since that contest, Iowa has been strong. The Wild have achieved a 14-7-3-3 record since December 5th and come into today's game on a three-game winning streak. Texas is 12-9-5-1 in the same span. A big part of their play in the new year has been Niklas Svedberg. The former Bruins farmhand has won seven of his last eight contests coming into this weekend. The Wild and Svedberg will be well-rested coming into this weekend as they have not played since last Monday, a home game against San Antonio. Texas, of course, is coming in from Milwaukee yesterday. At least with the day game in Wisconsin, the Stars had a chance to sleep in a proper bed instead of on a bus. The Stars had a fantastic game yesterday with Mike McKenna notching his 27th career AHL shutout. Texas needed every one of those saves as Sheldon Dries was the only player to break through for a 1-0 victory. Can Landon Bow follow that up today against an Iowa offense that is ranked 9th in the league at 3.20 goals per game. The Wild and Stars are actually in nearly the same spot in the goals against column with 3.04 and 3.12 goals against per game, respectively. Colin Markison protects the puck against Alexandre Carrier. The Texas Stars got back in the win column against the Milwaukee Admirals, winning 1-0 in a low-scoring goaltender duel on Saturday. Sheldon Dries scored the lone goal in the opening minutes of the game, and the rest was heroics from Mike McKenna and Anders Lindback in their respective nets. Dries broke his double digit game scoring drought and picked up his 10th goal of the season in impressively strange fashion. To open the scoring two minutes into the game, he batted the puck out of the air after it bounced off the end boards to beat former Star Lindback. Mike McKenna had a 27 save shutout in what was probably his best game of the season, and the Stars needed every bit of it. Both goalies traded big saves for the rest of the first period. 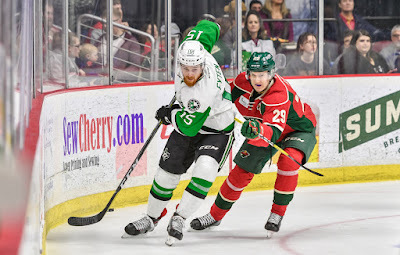 The recent Stars acquisition and former Admiral Tyler Kelleher served time in the penalty box on a too many men penalty and a slashing minor in the second period. Both teams had three power play chances heading into the second intermission without cashing in. 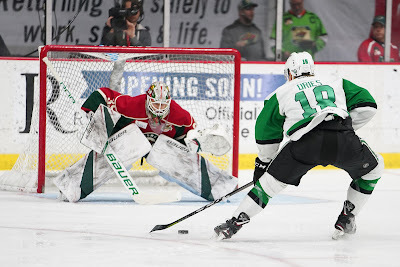 McKenna had to step up on a shot from the slot to keep the the Stars ahead and preserve his shutout bid in the last two minutes of the middle frame. 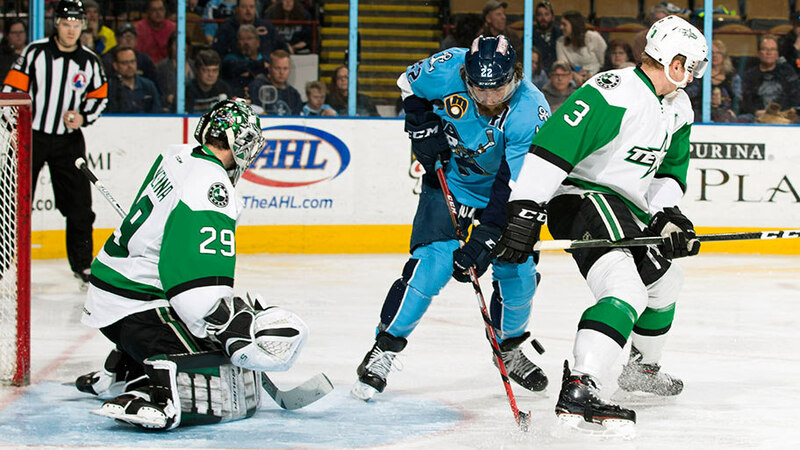 The Admirals edged the Stars in shots up to that point 19-17. The game-tying goal continued to elude the Admirals as McKenna frustrated their forwards, particularly on the penalty kill. He even managed to freeze a puck that was put on net when he was without his stick. The numbers ought to improve a bit for the Stars 27th ranked penalty kill after they were successful on five consecutive kills in the game. Lindback was just as good as McKenna down the stretch. With two minutes left in the final period, he made a big save on Roope Hintz from the slot. His lone blemish of the day, if you could call it that, was the goal from Dries which was enough to put the Admirals away. The Stars continue their swing through the Central division with the first of a back-to-back set against the Iowa Wild on Sunday. The puck drops at 3:00 PM CST. The Texas Stars are looking to get their act together after losing a pair of games to the Tucson Roadrunners last weekend. They will have to do so in a matinee game against a Milwaukee Admirals team that only trails them by one point, and yet is a couple of spots down in the standings in their division. The Admirals have been anchored in net this year by former Star Anders Lindback (.906 SP). The Stars will also get reacquainted with forward Mark McNeill, who was sent to Milwaukee in a transaction that netted them Andrew O'Brien and Tyler Kelleher. Going 4-5-0-1 in their last 10 games, the Admirals possess solid special teams and sit just outside the top 10 with an 18.7 power play percentage. Milwaukee will be without their leading scorer Bobby Butler as he is on the U.S. men's Olympic roster. The acquisition of O'Brien and Kelleher from the Admirals has yet to yield anything of note, but it will be interesting to see how they play against their former team. Dillon Heatherington will be back in the mix on the blue line, but Jason Dickinson had to re-join the parent club with Antoine Roussel on the mend. 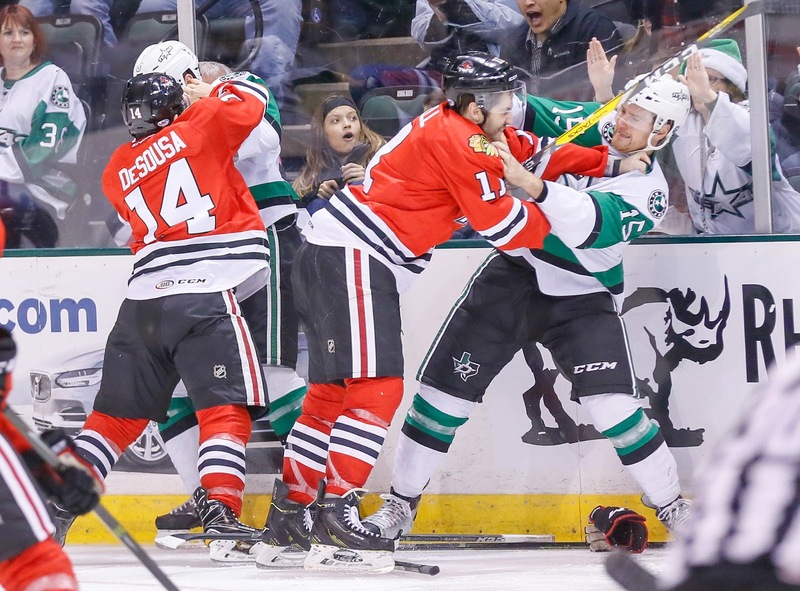 As Stars fans have seen without both Dickinson and Curtis McKenzie in the lineup, scoring will be difficult to come by. It would greatly behoove the Stars for Landon Bow to have a stronger showing in net than he did in his last game against the Roadrunners when he was chased from the game. We've also partnered with Daniel Lavender at Admiral's Roundtable once again to get some super in-depth answers to our questions about the Ads. Here are his responses to some burning questions. Q. What’s been the story of the season so far? A. The Milwaukee Admirals of 2017-18 have been a story of continuous ups-and-downs. Even in recent memory they went from a four-game winning streak to a six-game losing streak to a four-game winning streak and a shootout loss. It's an unstable feeling for the most part but I think a reflection of a really young defense that has been made to sink or swim without a true veteran anchor back there. What's good though is that Anders Lindbäck has been nearly lights out all season long and that this is an Admirals group that has yet to really play to its full potential. I believe they are starting to inch closer to that and they are learning to do so while Bobby Butler, their top scorer, competes in the Olympics. Q. How has Mark McNeill fit in so far for the team? A. He has quickly been put into the mix on the right wing alongside Mark Zengerle and Harry Zolnierczyk. He's the same big, versatile, and skilled forward that I remember when seeing him routinely with the Rockford IceHogs in the Chicago Blackhawks pipeline. I think him not having played that much prior to getting shipped our way might have had its slight rust knocking off period but he's getting better with more playing time. Q. Milwaukee was on a losing streak but now has points in the last five. What changed? A. I would say that when you're on the sort of losing streak that the Admirals were on you either eventually admit defeat and stay that course or see so many of the problems and "shoot self in foot" moments that you learn from them and grow. The Admirals young defense and often times scrambly nature with transition hockey can lend itself to trouble. The Admirals are tied for the league lead with 11 shorthanded goals conceded... but bizarrely also lead the Western Conference by having scored 9 shorthanded goals. It's a slight run and gun style that I think is starting to get beaten out and replaced by a far more simplified and direct game that is all about going hard to the net. I often feel less is more. That's the style that the Admirals need to stick to in order to play their best hockey. Q. For the first time in a long time, Milwaukee looks to be relying on veteran goaltending without a new hot prospect taking a huge chunk of games. How has (former Texas Star) Anders Lindback handled the load? A. Lindbäck has been the MVP of this year's team and second place in that discussion isn't even remotely close. He has been such a workhorse all season. He's played the most games (37), logged the most minutes (2220:47), has faced the most shots (1174), and made the most saves (1064) of any goaltender in the AHL this season and is second to only Alex Nedeljkovic of the Charlotte Checkers in wins - and that can very well change soon enough with a single win separating them. It is almost surreal that Lindbäck started last season without even an AHL guarantee and ended up seeing a professional try-out contract with the Ontario Reign cut after four-games followed by a trip back to Sweden with Rögle BK. Lindbäck has been brilliant all season and I think has done himself a world of good in getting back in the good graces of an NHL radar. I think he might have matured late and revived his NHL aspirations this season through the Admirals. Q. Love to hear a little bit about the season that Bobby Butler has had and his selection to the US Men’s Olympic roster. A. It's been awesome to see Bobby Butler get the chance to represent Team USA. He told former University of New Hampshire teammate and current Admirals captain Trevor Smith this off-season at a golf event that this was his goal. He signed specifically to an AHL contract with the Admirals. There were no guarantees that a guy like Butler was making Team USA based on any kind of past reputation alone. And he has gone about his work day in and day out to be one of the Admirals most consistent players. It's so great for him and his family that he made it. No one can ever take these moments from him. Q. Texas isn’t getting much exposure to the Central Division this season, but more will be coming next year. What’s been going on in the Central this year? The numbers show Milwaukee is doing alright by percentages, but clubs like Manitoba are just blowing it away. A. This is the tightest playoff race that I can remember across the entire Western Conference. In the Central Division you certainly have one team that is rocketing off to the moon (Manitoba Moose) and one that is boring its way to the depths of hell (Cleveland Monsters) but the race from second to sixth place is something that can vary through points percentage dramatically in a week's worth of games. It's that why I think the Admirals are really playing in catch-up mode after such rough goes of form across December and January. They'll be fortunate to make the most out of all the home games they have in-hand as opposed to the rest of the division. This year's Central Division has been a woodchipper. It really has. And I think the Admirals will be fortunate to fight their way into this year's 2018 Calder Cup Playoffs but I worry for the Pacific Division team that awaits the Central Division's top draw come the Western Conference Finals. I won't be shocked one bit if the Calder Cup stays within the Central Division for another season. Jason Dickinson is racking up the air miles this season as he has been recalled to the NHL once again. The forward has been recalled ahead of tonight's game against St. Louis. Dickinson, 22, has appeared in 13 games with Dallas this season registering 12 shots and ten penalty minutes. In 33 games played with Texas this season, he has produced 22 points (16-6=22) and his 16 goals are second on the team. The Dallas Stars announced this morning that Derek Laxdal and Karl Taylor have both received contract extensions for the coming season. Head coach Laxdal and assistant coach Taylor are in their fourth season with Texas, making them the longest serving coaching staff in team history. Next season will be their fifth. The pair has compiled a 139-102-27-10 record in four seasons to this point. However, the club has yet to advance beyond the first round of the playoffs and did not qualify last season for only the second time in team history. Dallas, for its part, is extremely happy with the pipeline that Texas has provided in terms of player development. Eight different players currently in Dallas spent at least one season with Laxdal and Taylor in the AHL. Players like Jason Dickinson and Dillon Heatherington are knocking on the door of adding their names to that list. And surely, Denis Gurianov will also be in that conversation soon enough. Dallas Stars Assistant General Manager and Texas Stars General Manager Scott White announced today the club has extended the contracts of their coaching staff in the American Hockey League (AHL). Head coach Derek Laxdal and assistant coach Karl Taylor will both return next season to lead Texas, Dallas' top development affiliate in the AHL. Both coaches are currently in their fourth season with Texas and together have compiled a career record of 139-102-27-10 (.567 pct.) during their tenure. Texas has also qualified for the AHL’s Calder Cup Playoffs twice in its first three seasons under Laxdal and Taylor. The club is currently in a playoff spot this season, sitting third in the Pacific Division with a 25-18-5-2 record through 50 games played. Eight of the players currently on the Dallas roster spent at least a season playing under Laxdal and Taylor including Remi Elie, Radek Faksa, Julius Honka, Stephen Johns, Esa Lindell, Brett Ritchie, Devin Shore, and Gemel Smith. 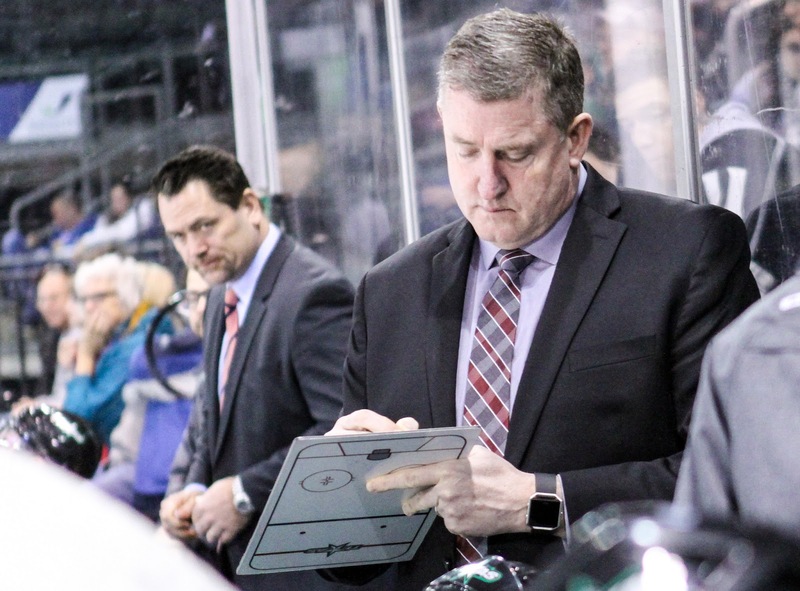 Laxdal was named the fourth head coach in Texas Stars history on July 3, 2014. He joined the Stars organization after concluding a four-year stretch (2010-2014) as head coach of the Western Hockey League’s Edmonton Oil Kings, highlighted by winning the 2014 Memorial Cup as Canadian Hockey League champions. During his final campaign in Edmonton, Laxdal guided his team to a 50-19-3 record and in his four seasons coaching the Oil Kings, Laxdal achieved three 50-win seasons and finished with an overall record of 182-83-23 (.671 pct.). Taylor was named the assistant coach of the Texas Stars after completing a successful run with the Portland Winterhawks of the Western Hockey League. In his only season as an assistant with the Winterhawks, Taylor helped guide the team to a 54-13-5 record and finished second overall in the WHL. Joining the Stars organization marked a return to the American Hockey League for Taylor, who also served as an assistant coach for the Chicago Wolves in 2011-12. With Dickinson back in Texas, the Stars have assigned Samuel Laberge to Idaho. The rookie forward has appeared in 43 games for Texas, far more than I think I expected at the start of the season. He should do well in Idaho and perhaps be back sooner rather than later. 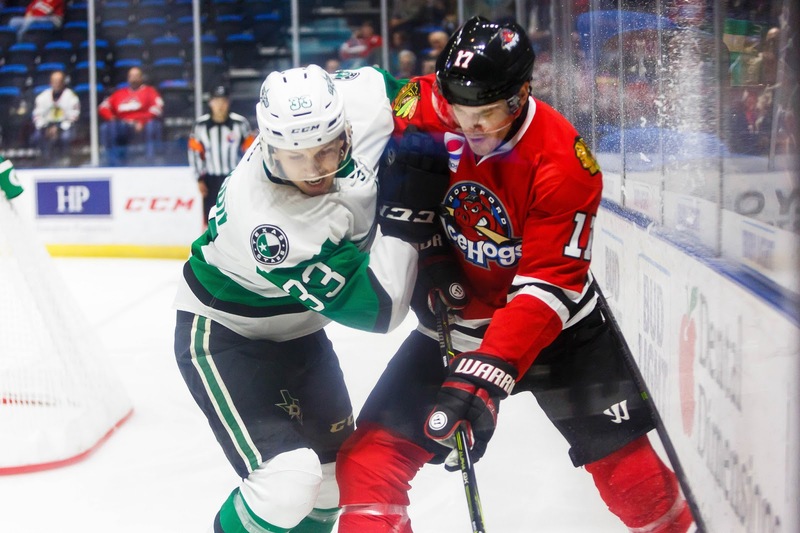 The Texas Stars, American Hockey League affiliate of the NHL’s Dallas Stars, announced Tuesday the team has reassigned forward Samuel Laberge to their ECHL affiliate, the Idaho Steelheads. Laberge, 20, is currently in his rookie season with the Stars and has appeared in 43 games for Texas with 12 points (4-8=12). The 6-foot-2, 200-pound native of Chateauguay, Qubec was signed to an AHL contract over the summer after competing for the last four seasons with the Rimouski Oceanic of the QMJHL. Today's piece is contributed by ProStockHockey. It must be great to be a pro athlete, right? Fame, travel, the finest hotels and the best gear for free. Not just free — the equipment guys pay you to use their gear. After all, LeBron James is going to be wearing Nike for the rest of his life, to the tune of, reportedly, more than $1 billion. Twenty-time Grand Slam tennis champ Roger Federer gets $10 million a year from Nike and another $2 million per year from his racket company, Wilson. Ah, but pro hockey isn’t pro basketball. Or tennis. Heck, it isn’t even golf. You’d think the players would get any piece of equipment they want, and companies would pay for the privilege of giving it to them. Well, yes, they do. In golf. And it’s not just pros. College players, promising juniors, even decent amateurs of any age can score free clubs and attendant paraphernalia. Other sports? Not so fast. Baseball players don’t get free bats. Top sluggers might get a discount, and teams will pay for their players’ bats, but that’s it. Of course, it’s not like the free advertising of using a wooden bat on television is going to help the manufacturers — virtually nobody except the pros use them. Hockey, at least for most players at the NHL level, is a lot like baseball. 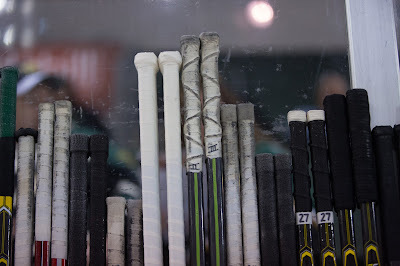 Players can use any equipment they want, and it is either provided by the manufacturer or the team, but few players are getting paid to play a certain stick, skate or glove. The best — and often best-compensated — players are most likely hauling in some sponsorship cash to go with their free gear. According to Forbes.com, the NHL’s highest-paid player is the Blackhawks’ Jonathan Toews, whose $13.8 million salary is augmented by $2.2 million in endorsements — which includes deals with Chevrolet, Upper Deck, Frameworth Hallmark and Canadian Tire, in addition to his equipment partner, Bauer. Forbes estimated that only Pittsburgh’s Sidney Crosby and Washington’s Alexander Ovechkin earn more off the ice than Toews. Crosby makes nearly $5 million in endorsements. Ovechkin, who returned to his first NHL equipment partner, CCM, this season after a six-year deal with Bauer expired, is at $4.5 million. It’s hard to pin down the exact value of gear sponsorship deals in the NHL, but in 2015 Crosby signed a six-year deal with Adidas reportedly worth more than $1 million per year — and at the time, Adidas owned CCM — still Crosby’s stick and skate brand of choice. While that’s not NBA sneaker contract money, neither is it chump change. However, Crosby is among the greatest ever to play the game. Some money trickles down, but some of the zeroes don’t. One stick manufacturer waded into the market in a big way in the early 2010s, pushing gear deals into the mid five-figure range — by one account, typically giving one third of the value in gear, two thirds in cash. In the first three categories above, equipment companies CCM and Bauer rank 1-2 in terms of popularity. In the other two categories, the order is reversed. Warrior is No. 3 for sticks, gloves, pants and helmets, while True ranks third for skates. Freedom of choice is one thing NHL players enjoy compared to their American Hockey League counterparts. The AHL, founded in 1936 and today the NHL’s minor league development arm, signed a five-year extension in 2016 of a multiyear deal with CCM as its exclusive supplier of sticks, gloves, pants, helmets and jerseys. That partnership was established in 2005, and, in terms of reach into a player’s locker, may be unparalleled in pro sports. Considering that more than 88 percent of current NHL players did time in the AHL, it’s no surprise that CCM is so widely used by NHL players. Indeed, it’s interesting to note that the one piece of equipment that CCM doesn’t supply exclusively to the AHL — skates — is the CCM item chosen least often by NHL players. According to Gear Geek, just 19.5 percent of current NHL players use CCM skates. But, while familiarity and brand loyalty seem to be paying off for CCM, it goes only so far. Some players seem eager to try out new products once they reach the NHL. Consider that CCM has no better than a 42 percent share of the NHL market in any equipment segment, hitting that number in pants and helmet usage. Author bio: AJ Lee is Marketing Coordinator for Pro Stock Hockey, an online hockey shop offering authentic pro stock hockey equipment. He was born and raised in the southwest suburbs of Chicago, and has been a huge Blackhawks fan his entire life. AJ picked up his first hockey stick at age 3 and hasn’t put it down yet. The Dallas Stars have returned Jason Dickinson and Dillon Heatherington to the Texas Stars this morning. 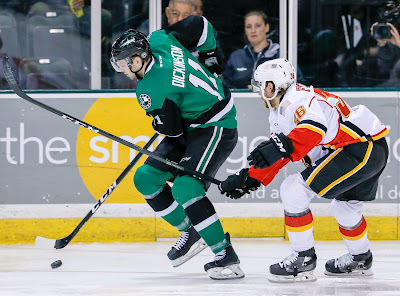 Dickinson and his 16 goals on the season help to fill a void with Curtis McKenzie out of the lineup for the coming road trip and into the foreseeable future. Dillon Heatherington will surely slide right back into the lineup but may not have his usual defensive partner with him. Brent Regner was boarded hard late in Saturday's game. The play resulted in a game misconduct to Laurent Dauphin. Texas does have all week for recovery with their next game coming Saturday afternoon in Milwaukee. 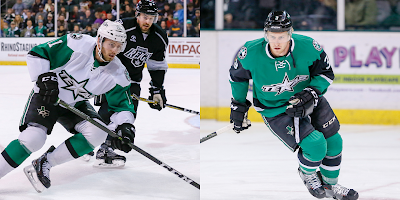 Dallas Stars General Manager Jim Nill announced today that the club has reassigned forward Jason Dickinson and defenseman Dillon Heatherington to the Texas Stars, Dallas' top development affiliate in the American Hockey League (AHL). 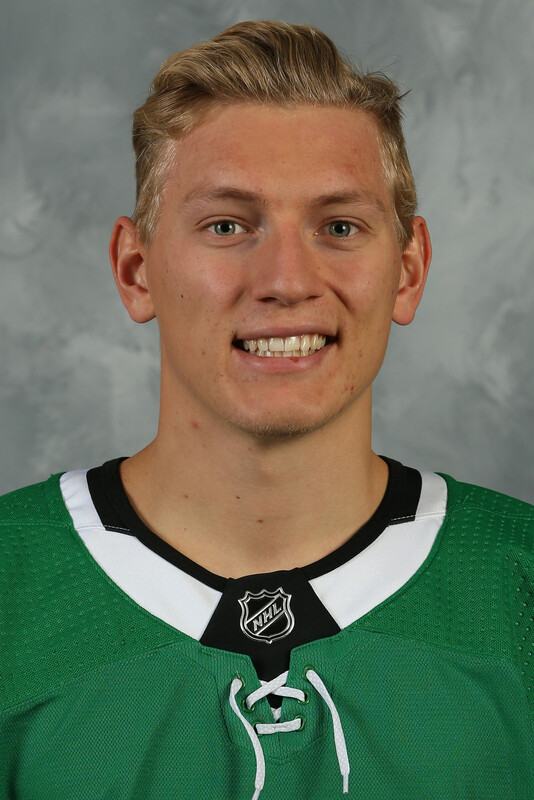 Heatherington, 22, has appeared in five games with Dallas this season recording one assist (0-1=1), a +3 plus/minus rating and 26 penalty minutes. He has also registered 13 points (3-10=13) in 41 games played for Texas this season. 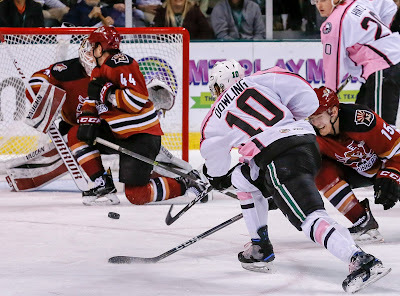 The Texas Stars earned a point but gave up two to the visiting Tucson Roadrunners with an overtime loss at home Saturday night. The Stars led most of the way thanks to an early 5-on-3 goal from Justin Dowling, but a deflection in the third tied things up, and overtime was unkind to Texas. "I thought we came out hard with a lot of energy," said Dowling. "Sometimes it's hard to come out with energy when you have a week off. It's easier when you're back to back. It was a great response." The game had a playoff feel to it as two teams in the top four of the division played a tight one. "We got up 1-0, and the game was managed well," said head coach Derek Laxdal. "They didn't look as fast as they did last night. We were physical and on our toes. It was a pretty tight game with a playoff atmosphere." The power play was both a bright spot and a miss in the same night. The Stars earned a 5-on-3 in the first period as Tyler Gaudet and Daniel Maggio both earned slashing minors on the same play. Justin Dowling completed a play from Brian Flynn and Travis Morin for his 7th of the season. Late, however, Texas got a chance to go ahead after Laurent Dauphin boarded Brent Regner and gave Texas a golden chance with a five-minute major. The Stars would have to wait for a Tommy Thompson minor to expire to take the power play. Dowling tells the rest, "We need to be sharper when we have a chance to win the game with the power play. I don't think we were sharp then. I think we were waiting to get into overtime to win there. We ended up taking a penalty, and it flips on us in overtime." Laxdal added, "We bobbled some pucks. The execution was there, but it wasn't great. Their penalty kill did a better job than our power play." Tracking down a puck behind his goal line, Niklas Hansson took a penalty for holding the stick and gave up the power play. Both teams earned a point as the game shifted to overtime, but Mike Sislo found twine as Tucson's power play began in the extra period. "That overtime goal. It is what it is. That's a great shot by Sislo. You need a brick wall in there to stop that." Mike McKenna had a fantastic night and held a clean sheet for most of the game. He was tested heavily in the second period with 13 saves on 13 shots. His glove grab from his stomach midway through the frame was a highlight reel effort. The Stars have some time off before they head to Milwaukee next weekend for a three-game swing through the Midwest. Last night's game should be quickly forgotten by all involved on the Texas side of things. Head coach Derek Laxdal called out the Stars' compete level repeatedly, noting that he didn't feel the team showed up until the third period. That much was evident to anyone in the building. With eight shots through two periods and a record-tying all-time low of 18 shots in the game total, it wasn't a strong 'compete' night. The loss dropped the Stars into 3rd place in the Pacific. A loss tonight combined with wins by Stockton, Ontario and San Antonio could drop them all the way to 6th place. Such is life in the tightly packed Pacific, where even the last place team has a .500 record. 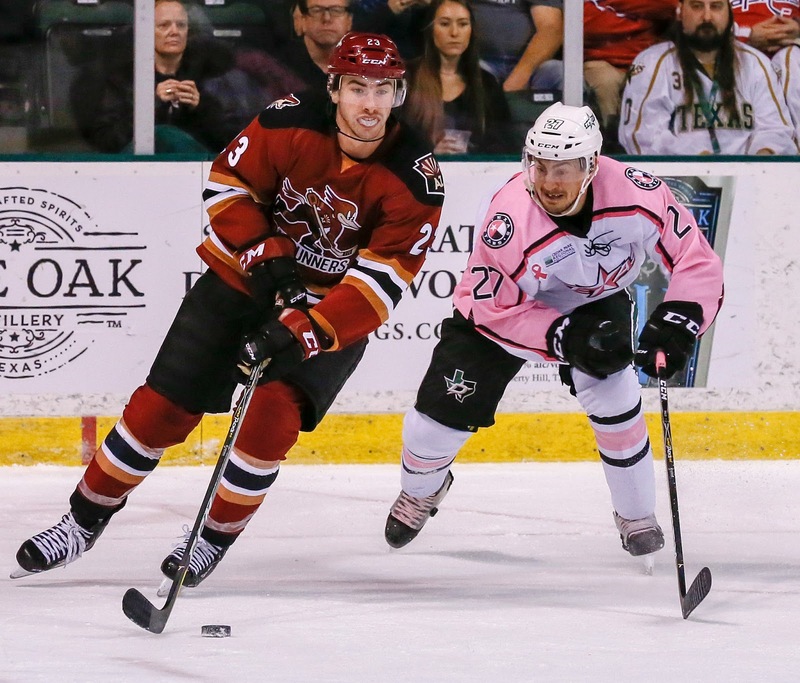 The Tucson Roadrunners dusted the Texas Stars 5-2 on Friday evening. Recent acquisitions Andrew O’Brien and Tyler Kelleher made their debuts but went largely unnoticed. The Stars matched a woeful record in their history--only recording 18 total shots on goal. “The one thing they did was compete, and we didn’t compete,” said Stars coach Derek Laxdal after the game. The last time the Stars recorded such low shot totals was in 2016 against the Iowa Wild. Tucson dynamo Dylan Strome was plenty noticeable for the Roadrunners, when he was on the ice, recording one assist on a power play goal. In a scary situation, he took a puck to the face with less than a minute to go in the second period but did return to the game in the third. Mike McKenna relieved Landon Bow (18 saves on 22 shots) late in the second period after he gave up back-to-back power play goals. Time in the offensive zone was hard to come by as the Roadrunners were backchecking and forcing turnovers. The Stars struggled to clear their own zone a few minutes after the Rallo goal, and Dysin Mayo’s shot from the point beat Bow, knotting the game up. Though the Stars were being heavily outshot, they were in decent shape with a potential tie headed into first intermission. What was once a routine finish to a lackluster period made a turn for the worst when the Stars gave up a goal with 0.1 seconds left on the clock. Tyler Gaudet crashed the net to put back his own rebound when Bow couldn’t freeze the puck in time. Zone time was still hard to come by in the second period, and it led to the Roadrunners getting three cracks at the power play that yielded two goals from Laurent Dauphin. On the first, he sent a screaming one timer from the right point in past Bow. The next goal came less than a minute later when he scored from in close and chase Bow from the game. 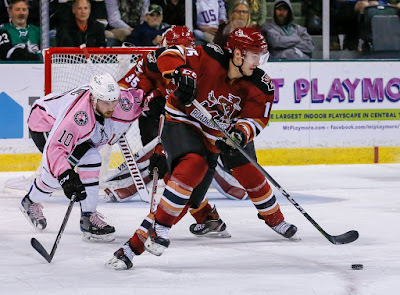 The Stars began the third period with a power play, and right after it expired, Reece Scarlett forced a turnover at the Tucson blue line and got the puck over to Travis Morin on the rush. Morin went five hole on Miska to temporarily inject a little buzz in the building. “We got it to 4-2 and pushed a little bit,” said Laxdal. Ultimately, the Stars were blanked on the power play after four chances. Rallo weighed in on the struggling power play: “It’s tough. Trying to simplify is what coach is preaching right now. Trying to just get puck to the net like [Tucson] did tonight. A couple of their goals were just shooting pucks to the net from the blue line and that’s something we have to focus on." The Stars complete their two game set on Saturday, February 10. The puck drops at 7:00 PM CST. The Tucson Roadrunners are for real. Led by a couple of rookie former number one draft picks, Dylan Strome (41 points) and Nick Merkley (35 points), the AHL club from the Sonoran desert have held a top five record in the league for most of the season. They have sat rather comfortably at the top of the Pacific division for weeks now, all while having played six less games than the Texas Stars. 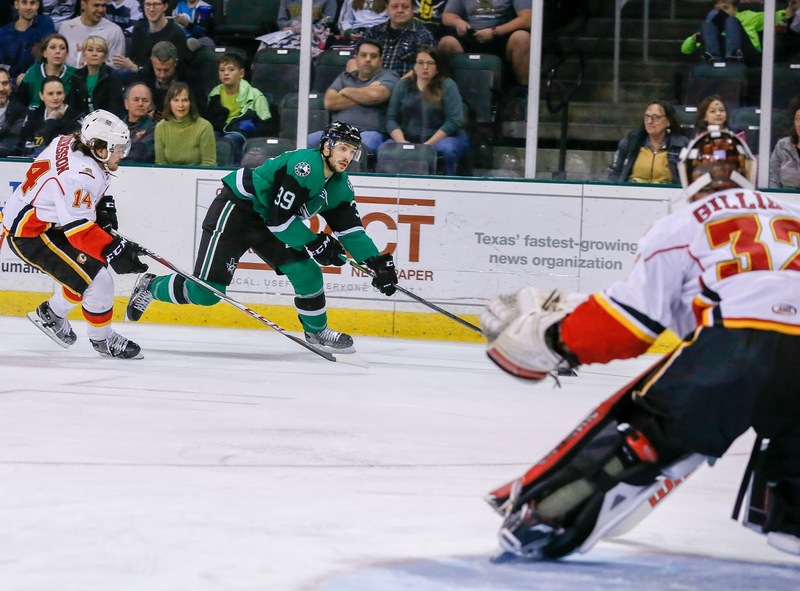 The Texas Stars have a chance to rectify the situation a bit as they take on Tucson in the first game of a back-to-back set on Friday evening. Signs point to the Stars being without their leading goal scorer and captain, Curtis McKenzie, as he is still nursing the injury that kept him out of the AHL All Star festivities. Strome represented the Roadrunners well at the tournament, which was really no surprise considering the season he is having. The Stars will have their hands full with him this weekend. Helped immensely by their top 10 power play unit, the Roadrunners have gone 7-3-0-0 in their last 10 games and are maintaining the pace they'll need to keep control of the division. The potential chink in their armor would be their putrid penalty kill, which sits just ahead of the 27th ranked Texas Stars. Heavy puck possession and drawing penalties will be key for the Stars to expose their rivals. Landon Bow is back in Cedar Park after having a cup of coffee with the Dallas Stars. Look for him to continue his normal rotation with Mike McKenna. In net for Tucson will be Adin Hill (.906 SP) who started for the parent club Arizona Coyotes against the Dallas Stars early in the season. His backup, rookie Hunter Miska (.905 SP), could start a game during the back-to-back. The Dallas Stars announced this morning that they will be holding 2018 training camp in Boise, Idaho, home of the Idaho Steelheads. The Texas Stars and H-E-B Center at Cedar Park had hosted training camp the past three years. Idaho has been Dallas's ECHL affiliate since _ and is currently riding a 14-year playoff streak. The Steelheads were set to host training camp in 2012, but that plan was scuttled by the NHL lockout. The preseason game with Minnesota that was also set to take place was sold out weeks beforehand. Suffice it to say that Boise is excited about NHL hockey. Of course, this is a blow to Cedar Park-based fans who want to see the Dallas Stars at H-E-B Center. However, consider that Texas Stars fans can drive up I-35 for three hours to see some NHL action and the same is not quite true in Boise. I went to Boise this time last year and wrote extensively about the fantastic experience I had there. If you can make the trip, I highly recommend it. The Dallas Stars today announced that they will hold their 2018 Training Camp at CenturyLink Arena in Boise, ID, home to the Idaho Steelheads, who serve as the team's development affiliate in the ECHL. This marks the first time that the team will hold their training camp in Idaho and it will run from Sept. 14 - 16. "The Idaho Steelheads have been a tremendous affiliate of ours for fourteen seasons," said Dallas Stars President and Chief Executive Officer Jim Lites. "In holding our training camp there, we're thrilled to give their fans the chance to appreciate Dallas Stars hockey up close and in person." The three-day training camp will culminate with a Victory Green vs. White Intrasquad Scrimmage on Sunday, Sept. 16. Steelheads season ticket holders will have the first opportunity to purchase tickets for the scrimmage, after which tickets will be made available to the general public. Dates to purchase tickets, and further details and ice times will be released for the camp at a later date. "We couldn't be more excited to welcome the Dallas Stars for training camp and to give our fans an opportunity to see the best of the best on the ice here in Idaho," said Steelheads President Eric Trapp. "We have been trying to bring an NHL event to CenturyLink Arena for years and we are thrilled that everything has come together for this summer. I think the Stars players are going to enjoy our facilities and everything that Boise has to offer, and Steelheads fans will be on hand to see world-class players in practice and game action." Following his one-game outing on Saturday, G Philippe Desrosiers has been returned to the ECHL's Idaho Steelheads. The second-round pick availed himself well of the opportunity to start an AHL game. Even without Denis Gurianov's hat trick, Texas would have been in good hands and won thanks to Desrosiers' 1-goal against effort. It's also a great sign that Desrosiers was able to stick around for a few extra days in Austin to get some practice reps with the Texas Stars and more time with goalie coach Jim Bedard. He didn't do anything wrong to be sent down. Right now it's just a numbers game. 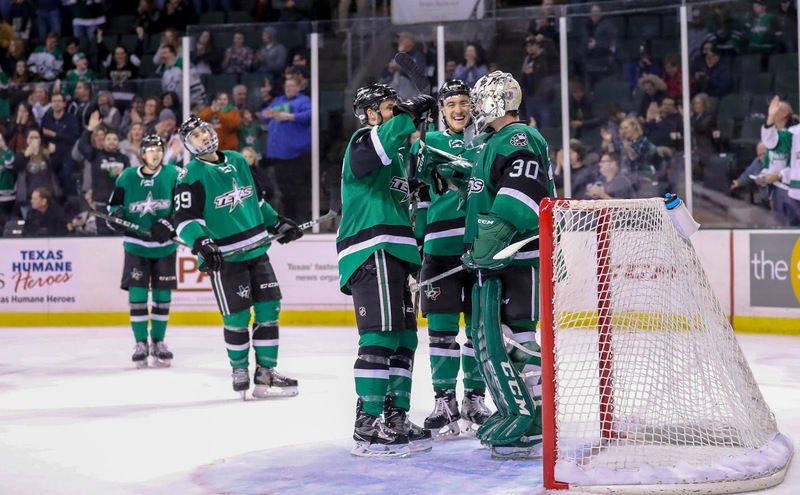 The Texas Stars, American Hockey League affiliate of the NHL’s Dallas Stars, announced Wednesday rookie goaltender Phil Desrosiers has been reassigned to the team’s ECHL affiliate, the Idaho Steelheads. Desrosiers, 22, is 17-6-2 with Idaho this season with a 2.74 goals against average and a .907 save percentage. The 6-foot-1, 190-pound netminder made his AHL season debut and stopped 23 of 24 shots in a 5-1 win over the San Antonio Rampage last Saturday. The Texas Stars are having a pretty good few weeks in terms of attendance. I expanded on their recent success on Twitter and wanted to make sure nobody on the blog missed out. You can always be the first to know by following 100 Degree Hockey on Twitter. 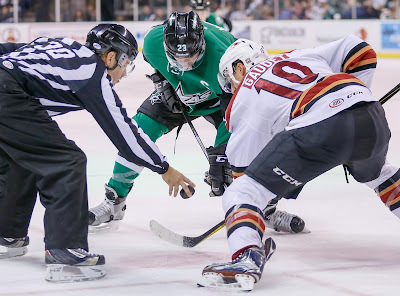 Through 23 homes games, #txstars are having their third best year in average attendance. The team has also tied its mark for games >6000 to this point with six so far this year. The back-to-back sellouts are a first though. Texas has strung together 3+ games above 6000 three times before, but they were all from 2009-11. With 15 games to go at home, #txstars have two sellouts (and tend to have more in the spring than the fall). Their record is five in 2014-15. #txstars actually had a pretty rough first half attendance number (Avg. 4950, 2nd lowest historically). Their second half numbers have spiked (low sample set) but 4 of 5 are >6000.